To harness the limitless opportunities of nanotechnology applications in the health sector, it would be imperative to develop nanotechnology in a responsible way. This paper focuses on applications of nanotechnology in health care and medicine in India, first describing the main research and developments therein and then analysing the policy issues. Although a specific nanotechnology regulation does not currently exist, there is a whole range of regulatory instruments that do and will extend to the nanotechnology applications in India. This paper discusses the regulatory adequacy and capacity of these instruments to address the concerns emanating from nanotechnology development in the health sector in India. The main challenges pertaining to nanotechnology regulation relate to regulatory capacity, information asymmetry, inter-agency coordination, and overlapping roles and mandates. Responsible governance of nanotechnology would entail the democratisation of the governance process by way of facilitating dialogue and learning across state and non-state actors and the industry needs to be an integral part of this. © Manish Anand, Nidhi Srivastava and Shilpanjali Deshpande Sarma 2012. Nanotechnology is a rapidly expanding field, focused on the development and application of structures, materials, devices and systems with fundamentally new properties and functions deriving from their size, which ranges from about one to hundred nanometres (nm). Exploitation of novel properties and phenomena at the nano scale enables novel applications across a range of sectors and embraces diverse disciplines. Nanotechnology is expected to revolutionise the health sector. The field of nanomedicine dealing with the application of nanotechnology in the areas of health care and disease diagnosis and treatment offers a lot of promise in the medical field, as it enables interdisciplinary study involving the disciplines of physics, chemistry, molecular biology, health sciences and engineering. In pharmaceuticals nanotechnology can enable better targeting of pharmaceuticals to specific cells, greater dosage consistency, faster pharmaceutical action, and decreased toxicity. Nanotechnology based new drug delivery systems is being tried for diseases like cancer, diabetes, fungal and viral infections and gene therapy. Nanotechnology has also found its use in diagnosis as contrast agents, fluorescent dyes and magnetic nanoparticles and may help in the early detection and treatment of various cancers. Using nanoparticles as cancer protein can make the early detection of cancer possible as well as monitoring the efficacy of on-going treatment for cancer. Nanoparticles like ‘dendrimer’ (nanomolecules with regular branching structures) and ‘buckyballs’ (a carbon allotrope) hold a lot of promise for the treatment of cancer. In diabetes early detection of higher glucose levels can be useful for avoiding problems associated with delayed diagnosis of the disease. Nanosensors based self-testing toolkits can be possible for a variety of diseases. Carbon nanotubes which are tubular structures varying in length ranging from1 μm to a few micrometers and characterised by greater strength and stability can be used as stable drug carriers. In sum, the expectations from nanotechnology in health care and medicine are high and the potential benefits are vast. The very same attributes which make nanotechnology so unique and endowed with immense potential for both societal benefits and economic gain, also pose questions regarding their safety and carry social, economic, ethical and other implications. The notion of risk in the context of emerging technologies stems from the experiences with past technology applications such as, asbestos and pesticides which despite short term benefits have contributed to environment and health risks. In the case of nanotechnologies it is feared that the unique physico-chemical properties of engineered nanomaterials that bestow improved functionalities to nanoapplications can also pose a threat to the health of humans and ecosystems. More specifically, nanomaterials, due to their tiny size, are able to enter organ and cellular systems while their enhanced surface endows them with the potential of greater reactivity. However, since nanomaterials comprise a diverse group of materials with different physic-chemical properties, human and environmental interaction with these chemicals might provoke varied impacts presenting serious challenges in anticipating the potential risks. Risk manifestation from nanotechnologies is likely to be influenced by both the probability of exposures to nanomaterials as well as the severity of the effect of exposures. Nanomaterials have already been incorporated in a variety of products ranging from cosmetics and personal care products, textiles and sports goods, pharmaceutical and electronic products, paints and other coatings, catalysts and in some case even in home care and food products creating the possibility for exposures along the life cycle of these applications. Research on the life cycle of certain nano applications suggests that while the production of nanomaterials can generate occupational exposures to free nanoparticles, the same can also result from the use and disposal stages that facilitate the release of nanomaterials from the bulk phase leading to respiratory, dermal exposures or even ingestion of nanoparticles.There is a growing body of literature especially in the sphere of nanotoxicology which through in vitro and in vivo experiments indicates that specific nanomaterials could elicit toxic responses from humans and various other environmental species. Nanomaterial exposure through inhalation, dermal contact and ingestion is known to lead to their deposition in the respiratory tract, skin and gastro-intestinal tract respectively followed by its translocation and deposition to various other organ systems. Recent reports suggest that uptake and accumulation of nanoparticles can interfere with the transport of essential substances in and out of cells, adversely affecting cell functioning and leading to unwanted changes in cell physiology.Earlier research had also highlighted the potential sensitivity of cells and organ receptors to nanoparticles given that they can interfere with signaling processes and damage mitochondrial structures and the nucleus.Inhalation of nanoparticles like fullerenes and carbon nanotubes have been observed to cause inflammation and granulomas in the lungs and also damage the functioning of the cardiovascular system. Afew studies have also reported that multi-walled carbon nanotubes can induce carcinogenic responses in mice and rats.On the other hand, nano-titanium di-oxide when administered subcutaneously to pregnant mice was observed to induce reproductive toxicity in the offspring.Carbon nanotubes, metals and metal oxide nanoparticles are known to display toxicity towards several aquatic species such as crustaceans and fish. However, despite this evidence from laboratory-based experiments there is much uncertainty about the real life environmental and health impacts of nanomaterials due to the prevailing knowledge gaps as well as challenges that characterise the domain of risk assessments. For instance the absence of standardised testing protocols and exposure metrics for the toxicological evaluation of nanomaterials has led to contradictory results on the toxicity potential of similar nanomaterials as in the case of silver nanoparticles. Further, others point to the uncertainty about the alleged toxicity of nanomaterials highlighting the fact that as testing methods are not adapted to nanomaterials false positive results might result. Some studies have also indicated that only a limited number of nanomaterials have demonstrated toxic effects in tissue culture and animal experiments with high doses which might not be characteristic of real life exposures. Yet at present convenient and in-expensive methods to detect human and environmental exposures are still under development.Thus overall investigations have yet to lead to conclusive results and given this scenario opinion on the risk potential of nano applications remain divided. Nevertheless despite these uncertainties, it is widely acknowledged that greater research on the risk of nanomaterial use in important applications such as therapeutics is vital to facilitate the responsible development of products and the reaping of their benefits. Indeed nanomaterials have been shown to cause pulmonary inflammation, induce tumors, affect immune responses in vivo as well as interfere with cellular processes in vitro investigations (induce platelet aggregation, inhibit macrophage phagocytosis, affect mitrochondrial function and ionic transport).Hence investigating their use in applications like drug delivery, tissue regeneration meant for altering or rectifying existing health impairments is crucial to avoid any unintended impacts of the nanomaterial itself on the human system. Despite anticipated benefits, there has been some apprehension about the use of nanomaterials in health applications from the beginning. Some researchers investigating the health hazards of using nanoparticles in therapeutic applications have argued that due to their size and reactivity, nanoparticles might precipitate events involving “nonspecific” absorption, binding and carrying of “endogenous” or cellular components as well as react with cellular components and important mediators to interfere with important cell functions. More specifically nanoparticles used for drug delivery could interact with other protein molecules in the body after the release of the intended carrier protein molecule and form complexes with these other proteins, triggering functional changes leading to protein malfunctioning.More recently it is speculated that the nanoparticles used for drug delivery could pose hazards that are beyond those of conventional chemicals in delivery matrices.Another study by Costigan that reviewed the toxicology of nano-health applications identified four mechanisms for the cytotoxicity of nanoparticles in health products that include (i) chemical cytotoxicity of any of the nanoparticle constituents, (ii) degradation products of the nanoparticle which might contribute to the toxicity, (iii) endocytosis of the nanoparticle that leads to apoptisis of the cell or (iv) lysis of cell membrane due to nanoparticles. Nevertheless it has been pointed out that data on the chronic toxicity of nanomaterial use in health care is lacking. On the whole, there are still some contradictory opinions on the degree of the risks posed by nano-health applications. Some decision makers have highlighted that from what is known of the toxicity of nanoparticles there does not seem to be any mechanism of toxicity that could “evade conventional hazard identification testing” a prerequisite for compliance with regulations for health products. However other researchers have stressed the need for case to case safety tests for nanoformulations and have questioned the adequacy of current testing methods and existing regulations to address the risks from the use of nanomaterials in medicines. They have speculated that not all hazards may be detected by existing procedures and that additional specific testing may be necessary. Overall it is notable that most of the research described above has not been specifically directed towards regulatory needs, and therefore, approaches are not standardised nor do they meet the meticulous documentation and quality review requirements of regulatory science. Gaining consensus on usefulness of complex scientific information in the environmental regulatory decision-making process often is difficult, even when standardised protocols are available. This poses considerable challenges for governance of nanotechnology, with the governance framework being required to reconcile the need to provide a nurturing environment for the development of the technology and maximise societal benefits, while addressing the risks and socio-economic implications. Problems in nanotechnology governance arise from the fact that there is considerable scientific uncertainty regarding the risks to health and environment, the unavailability of metrology tools, the absence of standardised methodologies for risk assessment and management, difficulties in developing regulation in the face of such uncertainty and the like. These problems are magnified for developing countries lacking the resources as well as the capacity to engage in risk research, assessment and management and to develop and implement regulation, while being severely constrained by the lack of standards. Nanotechnology holds a lot of promise for the health sector in therapeutics, diagnostics, nanosensors and nanodevices, tissue engineering and regenerative medicine. With a view to harnessing this promise and potential of nanotechnology applications in the health sector in India and developing nanotechnology in a responsible manner this section maps the nanotechnology R&D landscape in the health sector in India. It then analyses the institutional framework of regulation for nanotechnology in health sector in India and discusses the regulatory adequacy and capacity to address the concerns emanating from nanotechnology development in the health sector in India. Nanomaterials can be used to deliver a drug to diseased cells in a controlled fashion. This cost effective and efficient method of drug delivery besides receiving support from government agencies has garnered a lot of interest and attention from public and private research institutes as well as industry in the recent years. Work in India in this area is currently being done in the development of bio-polymeric nanoparticles for drug delivery, molecular motors for nanomolecular switching, investigating the potential of using carbon nanotubes for drug delivery and biodegradable nanocarriers for targeted drug delivery. Therapeutic treatment for cancer, a disease which is assuming widespread proportion in developing countries, has received the largest attention. Synthesis and characterisation of novel drug carriers and nanoparticulate formulations is also ongoing. Nanospheres for treatment of endocrine tumours, drug delivery using PLGA nanoparticles for breast cancer treatment, using nanosystems for treatment of multiple myeloma, cancer of the plasma cells, are some of the research endeavours being currently pursued. Research in this area has also been undertaken for other ailments like inflammation of the lungs, Alzheimer’s disease, diabetes, tuberculosis, visceral leishmeniasis and malaria. Promises of theranostics – an emerging area in nanomedicine which promises fusion of therapy and diagnostics is also being researched in India. Nanomaterials provide opportunities to improve the functionality of devices and to adjust their properties for better biological compatibility. Micro-devices for cardiac use, nano-enabled fabrication of new device/structures, biosensors, development of techniques for reliable and fast dispersion and functionalisation of CNTs, bioactivity of bio-interfaced CNTs and their toxicity, optical probes based on quantum dots, use of semiconductor nanocrystals and dendrimer encapsulated gold nanoparticles for cancer diagnosis are some of the important areas that are being currently investigated in the India. Some of the achievements in this area include development of nanotechnology based diagnostic kit for tuberculosis, which is claimed to be portable, inexpensive and efficient to use, and the production of nanosensor based typhoid diagnostic kit. The pharmaceutical industry has also made some significant achievements in nanodevices like development of one dose a day ciprofloxacin using nanotechnology, tumor targeted taxol delivery using nanoparticles in Phase 2 clinical trial stage, improved ophthalmic delivery formulation using smart hydrogel nanoparticles, oral insulin formulation using nanoparticles carriers, and liposomal based Amphotericin B formulation. Tissue engineering covering virtually all kinds of tissues and organs are being pursued globally. Development of biodegradable nano-structured vascular grafts, three dimensional nanocomposites for bone tissue engineering, fabrication of nanobiomaterials for tissue engineering, biodegradable nanocomposite scaffolds are being developed in India using the unique properties of the nanoscale. Nanotechnology can also act as an enabler in the field of regenerative medicine, dealing with regeneration of tissues and organs using nanomaterials. A scaffold based approach for tissue regeneration involving in vitro cell culture studies is currently being pursued to understand the cell-nanomaterials interaction and the nature of cell attachment and proliferation on nanomaterials for rapid wound healing and preventing inflammation and infection. Work has also been undertaken on stem cells, progenitor cells and autologous adult cells with regenerative capability to take them to clinical application. Nanotechnology risks can be best understood in conjunction with its benefits. Precisely because of this the issue of enhancing capability must be addressed with the concern for its regulation. In many senses, the imperative to simultaneously respond to both calls presents a dilemma to states interested in an emerging technology. The predicament is more acutely felt in developing countries where limited resources translate into the issue of prioritisation between funding research for commercialisation and risk research. The nature of risk from nanotechnology would be the same for all countries engaged in technology development. However, the extent to which populations are exposed to these risks depends on institutional capacity of a particular state: existing regulatory mechanisms, information policy, stakeholder participation in establishing and reviewing safety standards, to name but a few dimensions. Institutional capacity in turn is context-specific, and hence adopting a developing country perspective brings these constraints and enabling factors into sharper focus. Although a specific nanotechnology regulation does not currently exist, it would be incorrect to say that nanotechnology and nanoparticles cannot be regulated in the absence of such a dedicated regulation. There is a whole range of regulatory instruments that do and will extend to the nanotechnology applications in India. However, given that these instruments have been designed for regulation of different aspects of technology development and commercialisation in general, their adequacy and capacity to address the concerns emanating from nanotechnology development is indeed something that needs in-depth critical analysis and deliberation. It is imperative to review the framework, as it exists for research on nanotechnology and for products developed using nanotechnology and nanoparticles. One of the key questions to address in designing a regulatory framework for technology application is whether at all we need technology specific regulation or if regulation of technology is something that needs to be built within the product regulatory regime. In order to be able to arrive at a definitive answer on this, we need to ask a few more questions – Can the present regulatory regime address the challenges of this new technology or applications from this technology? What are the components of the current regulatory regime that will be able to address these new challenges? To what extent are modifications required? With this background, this section maps the regulatory landscape as it exists and extends to nanotechnology research and application in India. The regulatory framework of any technological application would vary from product to product. Healthcare applications and cosmetics are fast catching up and most of the product development is taking place in this sector in India. Here, we analyse in detail the relevant legal and regulatory provision for drug and cosmetics in the context of nanotechnology. The Drugs and Cosmetics Act 1940 regulates all aspects of drugs and cosmetics pertaining to their import, manufacture, distribution and sale. Any manufacture or sale of drugs has to be in compliance with the standards laid down in the schedule of the Act. A patent or proprietary medicine cannot be sold, unless the true formula or list of active ingredients contained in it along with the quantities thereof is displayed in the prescribed manner on the label or container. While the inspector is empowered to collect sample, inspect and seize drugs, the central government is empowered even to prohibit manufacture, etc., of drug and cosmetic in public interest Such a prohibition can be imposed on import of drugs as well where such import is likely to involve any risk to human beings or animals or does not have therapeutic value. One of the most important provisions of the Act relevant to growing nano-based health applications in India is the very definition of “drugs” under the Act. The definition of “drug” includes medical devices. These will thus include gold/silver nanoparticles for targeted drug delivery, stents, implants, nanoceramics etc. As mentioned earlier, the regulations do not mention nanotechnology or nanomaterials, but often the scope is broad enough to include these within its ambit. This is the reason regulatory capacity becomes important in the case of nanotechnology. The law itself may be applicable to nanotechnology but its adequacy and efficacy rests on a range of other factors such as a robust risk research, and capacity of regulators to acknowledge and understand the challenges posed by nanotechnology. For instance, although the Act mandates a list of active ingredients on labels, not much progress can be made in terms of bridging the information gaps around the use of nanoparticles, unless there is consideration of nanoparticles as either new or modified ingredients. Currently, for patented and proprietary medicine, the prescribed labelling standard format puts no obligation to disclose the use of nanoparticles as ingredients. The Pharmacovigilance protocol is a post-marketing tool in ensuring the safety of pharmaceutical and related health products. The protocol is designed for the collation and analysis of data, and the use of the inferences to recommend informed regulatory interventions as well as communicating risks to healthcare professionals and the public. There is provision for monitoring adverse drug reactions of medicines in order to identify previously unexpected adverse drug reactions or to indicate that certain reactions occur more commonly than previously believed. All pharmaceutical companies are required to submit the Periodic Safety Update Reports (PSURs) every 6 monthly for the first 2 years of marketing in India, and annually for the subsequent 2 years. The Advisory Committee shall assess the regulatory information relating to safety in order to determine what action, if necessary, needs to be taken to improve safe use. Based on the available data, the Advisory Committee shall make recommendations on product label amendments, product withdrawals and suspension. The National Pharmacovigilance Programme shall encourage reporting of all suspected drug related adverse events, including those suspected to have been caused by herbal, traditional or alternative remedies. The reporting of seemingly insignificant or common adverse reactions would be important since it may highlight a widespread prescribing problem. The NPP is a voluntary instrument and there is no framework under which the reports of adverse drug reactions can be addressed in a comprehensive manner. Regulatory assessment has been missing in the past studies of drug reactions. Another area in which the protocol might be lacking is in terms of a clear conflict of interest. The duty to report adverse drug reactions is on the companies, which are developing and promoting those very drugs. The reporting should be done by a permanent and independent body, rather than being left to the companies earning profit out of the sale of drugs. In order to consolidate laws related to medical devices and to establish a Medical Device Regulatory Authority of India for establishing and maintaining a national system of controls relating to quality, safety, efficacy and availability of medical devices that are used in India, the Medical Devices Regulation Bill was prepared in 2006 but has not been enacted. Prepared by Department of Science and Technology (DST), the Bill defines “medical device” as any instrument, apparatus, implement, machine, appliance, implant, in vitro reagent or calibrator, software, material or other article intended by the manufacturer to be used for human beings for the purposes of diagnosis, prevention, monitoring, treatment or alleviation of a disease, injury, or for investigation, replacement, modification, or support of a physiological process, supporting or sustaining life, and control of conception. If this bill does get passed in the legislature, it will have major implications for the application of nanotechnology in the health sector as medical devices are an important area of research and commercialisation. The Bill views risk management as the systematic application of policies, procedures and practices to the tasks of analysing, evaluating and controlling risk; risk being defined as the “combination of the probability of occurrence of harm and the severity of that harm”. It provides for the establishment of a Medical Device Regulatory Authority of India (MDRA) to regulate and monitor the design, testing and evaluation, manufacture, packaging, labeling, import, sale, usage and disposal of medical devices, to ensure the availability of safe medical devices for human use in the country. It enables the laying down of regulations relating to essential principles of safety and performance of medical devices, and design and manufacturing requirements. One of the main functions of the MDRA is going to be providing for risk-based classification of medical devices. In principle the focus on risk management is commendable but a precautionary approach is not reflected adequately in the functioning of the Bill. Another concern with respect to the Bill is the fact that Drug and Cosmetics Act 1940 includes medical devices within the definition of drugs, therefore there will be overlaps and problems, especially in the transition phase for changing the regulatory authority from drug controller to the new medical device regulatory authority. This can be illustrated by the fact that Central Drugs Standard Control Organisation (CDSCO) under the health ministry issues guidelines and clarifications from time to time regarding the import and manufacture of medical devices under the Drugs and Cosmetics Acts and Rules (DCAR). Many of these devices for which guidance has been issued include stents, implants etc. – devices in which nanotechnology is being used. It can be argued that the Ministry of Health and Family Welfare may be better equipped to regulate medical devices as compared to the Department of Science and Technology (DST), in view of its experience and overall ministerial mandate. The above analysis shows that in principle, any new product or application has to go through a procedure for obtaining licences from a designated agency. This is applicable to products based on or making use of nanotechnology. The positive side of the current regime is that there exists considerable textual flexibility that can allow for stronger intervention by regulatory authorities at the level of subordinate legislation, guidelines or implementation. In the absence of a specific nanotechnology regulation, it is imperative that the existing regime is supported by research and the strengthening of regulatory capacity to address the nano-related risks. In order to manage the risks at the very inception, it is at this level that regulatory institutions can be made. However, this requires recognition of nanoparticles as distinct ingredients (or with different properties) on a substantive level and together with an up-to-date risk assessment and technical know-how. 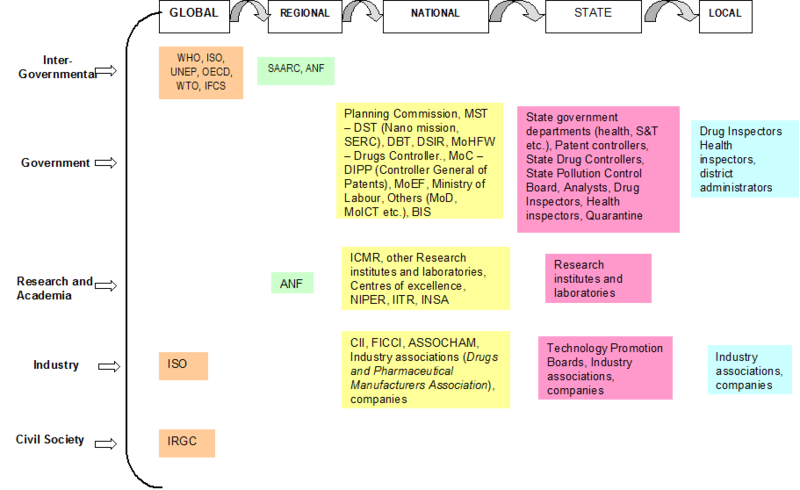 The governance framework for nanotechnology development in health sector in India includes a host of actors (Figure 1). This section looks at the institutional framework of regulation for nanotechnology in health sector in India and maps the different actors at different levels having a role in governance of technology, how they interact with each other and how they influence the nanotechnology landscape in India and in medical applications in particular. Figure 1: Nanotechnology in health sector in India: Actors. A regulatory governance framework of nanotechnology in the health sector would involve examining governments across levels – local, provincial, national and international – as well as assessing the sub-political and apolitical sites of regime creation. There has been a growing trend towards the acceptability of international forums/institutions as efficient and effective sites of regime creation. Some of the important and active sites are characteristically sub-political in nature in as much as they lack effective legitimacy and formal rule making or implementation power. In the case of health, the role of World Health Organization (WHO) is central as it garners acceptance by countries and institutions and hence, there is legitimacy of its definitions, decisions, and directives. One of the founding mandates of WHO is to “develop, establish and promote international standards with respect to food, biological, pharmaceutical and similar products”. To this effect, the Department of Essential Medicines and Pharmaceutical Policies at WHO develops guidelines, builds capacity and promotes medicine safety through pharmacovigilance at the global, regional and country level. No action is currently being taken specifically on nanotechnology as yet, except through its intergovernmental forum on chemical safety. The Intergovernmental Forum on Chemical Safety (IFCS), International Standards Organization (ISO), and the International Risk Governance Council (IRGC) are three sites that need special mention for their sub-political nature in the context of nanotechnology. Norms emanating from international sub-political sites have previously had an influential role in domestic regime creation. Given that the Indian domestic regime for nanotechnology is still at a nascent stage and is essentially reactive in nature, the deliberations within the aforementioned sites could have considerable influence in the governance of nanotechnology in India. Unlike governmental institutions, they suffer from a democratic deficit, which is so crucial to provide legitimacy to their decisions. These sites, therefore, prefer indirect means of policy implementation through an indirect channel of influence. At the national level, the Ministry of Science and Technology is the nodal ministry for promotion of research and development in the area of technology and administers its functions through three departments – Department of Science and Technology (DST, Department of Biotechnology (DBT) and Department of Scientific and Industrial Research (DSIR). DST has been the most instrumental agency within the government for encouraging nanotechnology development and application through both financial and institutional support. In 2001, a Nano Science and Technology Initiative (NSTI) was launched and as a follow up to it, Nano Mission was set up in 2007. The Department, since engaged with the agenda of promoting nanotechnology as a thrust area, has declared an investment of 10,000 million INR for five years, beginning in 2007 for basic and applied research promotion, infrastructure support, education and international collaboration in this regard. The department provides the secretariat to the Nano Mission Council, which is the highest policy-making body for nanotechnology in India. Besides the Council, the Nano Mission includes two other advisory groups, viz., Nano Applications and Technology Advisory Group and the Nano Science and Advisory Group. DBT and DSIR too have been supporting some research in nanotechnology, although not in any organised manner. While DBT has focused essentially on nano-biotech research, most of the nano-research funded by DSIR pertains to materials, metals and chemicals. Institutes and laboratories under the Council for Scientific and Industrial research such as the Central Drug Research Institute and the Indian Toxicological Research Institute are engaged in crucial and specialised research fundamental for nanotechnology governance. The Ministry of Commerce and Industry and especially the Department of Industrial Policy and Promotion (DIPP), aims at facilitating investment and technology flows in industrial development. The Office of the Controller General of Patents, Designs & Trade Marks is also a part of the DIPP thus making Ministry of Commerce and Industry an important actor in protecting intellectual property rights in the field of nanotechnology and being responsible for addressing the complexities of nanotechnology in the current patent legislation. Given that most of the R&D and applications are taking place in health sector and products are being launched in the market, the role of the Ministry of Health and Family Welfare (MHFW) is very important. However, unlike the Ministry of Science and Technology, there is no special nano-programme in the profile of MHFW. Research in health related applications, including those which are nanotechnology based, is promoted through the Indian Council of Medical Research (ICMR), which has a mandate to direct research funding in areas of national health importance. The Ministry of Health is involved in governance of nanotechnology applications in health sector through its Directorate General of Health Services, under which the Central Drugs Standard Control Organisation is situated. Health being a state subject is largely in the domain of state governments but a lot of the direction for health comes from the Centre (Figure 2). Institutionally, MHFW is in charge of prevention and control of health related hazards, but the agenda of MHFW is already full with issues like providing basic health infrastructure, eradication of diseases like polio, kala azar etc. and checking counterfeit drugs to lay priority on nano-applications in the health sector. Moreover, the current health applications in nanotechnology are more focused towards curative applications rather than public health. The Ministry of Environment and Forest deals with environmental impacts or hazards emanating from a new application. The environment being a residuary subject falls in the ambit of the Centre and the Central Pollution Control Board (CPCB) discharges most of the functions relating to prevention and control of pollution, including pollution through hazardous materials. Central institutes under the Department of Pharmaceuticals, Ministry of Chemicals and Fertilisers are engaged with advanced studies and research in pharmaceutical sciences, including toxicology. They also have the mandate for conducting programmes on drug surveillance, community pharmacy and pharmaceutical management. 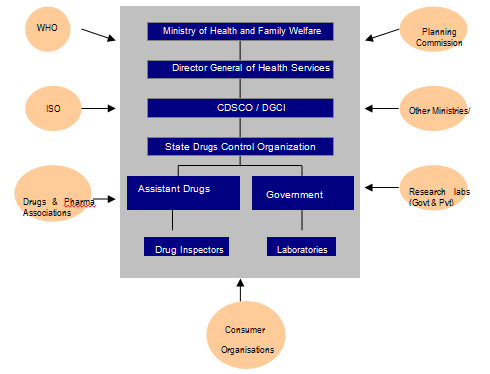 Figure 2: Actors in Drug and Pharmaceutical Regulation in India. At the central level, the Controller General of Patents, Designs and Trade Marks under DIPP is in charge of patents. The legislation and policies on patents are made at the national level (with a great amount of international influence) but patents are filed, examined and granted at one of the four patent offices located in Delhi, Mumbai, Chennai and Kolkata. State governments also invest in nanotechnology research and development. Most of the centres of excellence or research institutes working on nanotechnology are funded or supported by the central government. However, states have a role to play in promotion of R&D and the provision of infrastructure and other required resources for the promotion of research and development in the field of nanotechnology. These research institutes and laboratories also provide the institutional support required for discharge of regulatory functions of the state level agencies for health and environment. The CDSCO is responsible for drugs approval and laying down standards but implementation takes place at the level of states and union territories. There are thirty-five State Drug Controllers (SDC), which have the primary responsibility of overseeing the regulation, manufacture, sale and distribution (including licensing) of drugs. In their tasks, the SDCs are guided by the CDSCO and aided by government analysts and drug inspectors. State Pollution Control Boards (SPCBs) are the state level authorities under the Environment Protection Act 1986 (EPA). The SPCBs does not look at nanotechnology applications or health applications. However, any commercial establishment or manufacturing process will have to adhere to standards laid down by the EPA and Hazardous Materials Rules, thereby bringing them under supervision of SPCBS. The State Pollution Control Committees are responsible for granting authorisation for collection, reception, storage, treatment and disposal of bio-medical waste. In the overall governance framework for any technology, either with respect to environmental impact or health impact, there is a limited role for local authorities. This is ironic as the impact of an emerging technology percolates down to the lowest levels. Drug inspectors and health and sanitation inspectors monitor and operate at local levels also. Local authorities can take suo motu action in case of a public nuisance (including risk to environment and human health) being caused by a technology developer or a manufacturing process. This is of utmost importance as the impact of any technological introduction will be felt locally. Local authorities and stakeholders may not have had a say in the decision-making process for development or regulation of technology but it is pertinent to note that several products are launched on ‘pilot scale’ at local or rural levels. Any regulation is as efficient as the institutions framing it and implementing it. Hence, regulatory capacity is one of the pre-requisites of a competent institutional framework. Capacity for the formulation of rules, policies and guidelines, as well as implementing is crucial. As we have seen in the previous section, there are several amendments, initiatives at the level of rules, notifications, schedules etc. required for enabling the existing regulatory regime to respond to the challenges posed by nanotechnology. Such interventions would require great amount of technical expertise and foresight on the part of policy makers and regulators. The implementing agencies need to be equipped to execute the rules and regulations that are already in place and are formulated from time to time. The agency responsible for the regulation of drugs already faces challenges with respect to capacity in terms of even testing of drugs. Considering the lack of capacity for existing drugs with known risks, it is obvious that regulating drugs with risks yet to be known and defined would be an almost impossible task. Further known capacity for testing nanoparticle toxicity exists only at a very few institutes like National Institute of Pharmaceutical Education and Research (NIPER), under the Ministry of Chemicals and Fertilisers (MCF) and at the Indian Institute of Toxicology Research (IITR), a Council of Scientific and Industrial Research (CSIR) laboratory. Lack of capacity can also be linked to informational asymmetry. A smooth flow of information is necessary for building institutional capacity and taking regulatory measures. Since the main concerns around nanotechnology are the environmental, health, and occupational and general safety (EHS) risks, regulation of which necessitates availability of information, both about the nature and extent of applications as well as the risks associated, it becomes absolutely important that such information is readily available to the regulators. This becomes even more crucial because risk and toxicity studies are specialised disciplines, which only a few institutes are equipped to carry out and may be beyond the capabilities of regulatory institutions. Hence, the information amongst agencies, with different mandates, such as DST, DSIR, MHFW, MCF and the research institutes should be channelled in a way that each of these institutions perform their functions and further their mandate in an informed manner favourable to the well-being of public at large. Coordination and exchange of information amongst research institutes can best be done at the level of research institutes themselves. This is particularly important in health applications which public institutions and centres of excellence are researching. It is vital for these to be connected with dedicated drugs research institutes and laboratories like CDRI and NIPER. Besides, institutes dealing with toxicity research should be a part of this network. Another related outcome of the institutional structure (i.e. the departments’ form of agency creation) within the government of India has been the fracturing of regulatory jurisdiction between agencies. Environmental health is an important area of regulation specifically in the context the potentially adverse impacts of emerging technologies like nanotechnology and biotechnology. However the division of the regulatory mandate between Ministry of Health and Family Welfare (MHFW) and the Ministry of Environment and Forest (MEF) has made it difficult to provide comprehensive and coherent regulatory cover on the issue of environmental health. In fact environmental health as a policy discipline is underdeveloped in the Indian context. Thus the fragmentation of mandates further exacerbates regulatory fissures in situations where the state indirectly undermines regulatory overtures by privileging technology within the development agenda of the state by setting up individual state departments with the sole objective of technology promotion and facilitation. Even within a ministry, this fragmentation is evident. The issues in effective drug regulation have been raised time and again by different committees which have suggested coordination between state units, states to provide personnel, testing facilities and support systems and adoption of post-marketing surveillance. Some of these are in fact covered by the National Pharmacovigilance Protocol, set up with the primary aim of creating and managing a database of reports of Adverse Drug Reactions (ADRs) that would form the basis for regulatory decisions for market authorisations of drugs in India. Given that there is still widespread uncertainty as to the health implications of nanotechnology applications, these obligatory reporting requirements making on pharmaceutical company marketing lays the foundation for a vigilant and early detection system of any adverse reactions. Nanotechnology development in health sector in India and its governance are intertwined and continually affecting each other. Governance of nanotechnology takes into account the various actors participating in the decision-making process as well as the procedures that legitimise the decision-making process. Nanotechnology governance in the Indian health sector is characterised by a fragmented R&D system largely concentrated in major cities, weak health services delivery at the district and local level, limited capacity for testing nanoparticle toxicity, paucity of data and risk assessment studies to guide the risk governance process. There is a need for standardising nanotoxicological assays and developing reference materials. Considerable research needs to be undertaken in the areas of nanotoxicology, risk assessment and life cycle analysis to understand and address risks emerging from nanomaterials. The governance framework for nanotechnology in health sector in India would ideally involve a host of actors and institutions including research bodies, promotional agencies, planning bodies, nodal ministries, other ministries, regulatory agencies, implementing agencies etc. performing different functions. For responsible governance of nanotechnology in the health sector in India, it is essential to identify the roles for different actors and stakeholders. The role of international forums such as the IRGC, ISO, WHO in taking the lead in setting guidelines, in the establishment and enforcement of international standards, and in facilitating a network of information and monitoring for adoption and amalgamation in domestic policies becomes important in the Indian context. The ambit and scope of government’s role need to be expanded to provide support to risk-related research, formulating guidelines for researchers and industry, the setting of short-term and medium term agendas and fostering inter-disciplinary research with a focus on the social, ethical and other implications as well. The role of academia and research establishments in generating a critical mass of trained scientific manpower in the area of nanotechnology applications in the health sector would be paramount in strengthening the governance of nanotechnology in India. Similarly industry forms an integral part of the nanotechnology governance framework. In the wake of regulatory uncertainty and the dearth of nanotechnology-related standards, both internationally and domestically, companies can lead and practise self-regulation by coming up with and adhering to voluntary standards. They are also better positioned to collate and provide knowledge on impacts, occupational hazards, waste disposal etc. for further risk research and policy design. The role of civil society in the governance of nanotechnology, although challenging and difficult in the context of multi-sectoral applications of nanotechnology, becomes no less important. It can play an influential role as a watchdog especially with respect to environmental and health impacts of nanotechnology applications and in articulating the needs of the society and the health areas in need of nanotechnology intervention. This research was developed under the IDRC project Nanotechnology in South Asia: Building Capabilities and Governing the Technology in India, Pakistan and Sri Lanka. Portions of this paper are based upon: T E R I (2010), “Multi level governance (MLG) framework for nanotechnology”, New Delhi: The Energy and Resources Institute [Project Report No. 2006ST21] Research Deliverable no. D 8 and; TERI (2009), “Report on regulatory challenges posed by nanotechnology developments in India”, New Delhi: The Energy and Resources Institute [Project Report No. 2006ST21] Research Deliverable no. D 6. * Associate Fellows, The Energy and Resources Institute (TERI), New Delhi, India. RW Siegel, E Hu and MC Roco (eds) Nanostructure Science and Technology: A Wordwide Study (1999) A report prepared by the National Science and Technology Council, Washington D.C..
 M Ebbessen and TG Jensen. ”Nanomedicine: Techniques, Potential and Ethical Implications” (2006) 5 Journal of Biomedicine & Biotechnology 1-11; L Braydich-Stolle et al, “In Vitro Cytotoxicity of Nanoparticles in Mammalian Germline Stem Cells” (2005) 88 Toxicological Sciences 412–419. L Braydich-Stolle et al, “In Vitro Cytotoxicity of Nanoparticles in Mammalian Germline Stem Cells” (2005) 88 Toxicological Sciences 412–419; MC Till et al, “Nanotech Meets the FDA: A Success Story About the First Nanoparticulate Drugs Approved by the FDA”, (2005) 2 Nanotechnology Law & Business 163-167. BJ Feder, “Doctors Use Nanotechnology to Improve Health Care” (1 Nov 2004) N.Y. Times available at http://www.nytimes.com/2004/11/01/technology/01nano.html (accessed 18 Mar 2012). “Top Ten Nanotechnology Breakthroughs of 2005” (2005) 2(4) Nanotechnology Law & Business 414-417. J Miller et al, “A Realistic Assessment of the Commercialization of Nanotechnology: A Primer for Lawyers and Investors” (2004) 1(1) Nanotechnology Law & Business 10-22; V Parry, “The Nano State is Here” (25 Feb 2006) Times Online. M Ratner and D Ratner, Nanotechnology: A Gentle Introduction to the Next Big Idea (New Jersey: Prentice Hall Professional, 2003). RM Reilly, “Carbon Nanotubes: Potential Benefits and Risks of Nanotechnology in Nuclear Medicine” (2007) 48 Journal of Nuclear Medicine 1039-1042. SD Sarma, “Life Cycle of a Nanosilver Based Candle Filter: Examining Issues of Toxicity, Risks, Challenges and Policy Implications” (2011) 7 Journal of Biomedical Technology 83-84. G Oberdorster, “Biokinetics and Effects of Nanoparticles” in PP Simenova, N Opopol and M I Luster (eds), Nanotechnology-Toxicological Issues and Environmental Safety (The Nertherlands: Springer-Verlag, 2007) 15-51. Science News “Health Risks With Nanotechnology? Nanoparticles Can Hinder Intracellular Transport” (24 Aug 2011) Science Daily available at http://www.sciencedaily.com/releases/2011/08/110824091143.htm (accessed 18 Mar 2012). PJA Borm and W Kreyling, “Toxicological Hazards of Inhaled Nanoparticles – Potential Implications for Drug Delivery” (2004) 4 Journal of Nanoscience and Nanotechnology 521-531. J Pauluhn, “ Subchronic 13-week Inhalation Exposure of Rats to Multi-walled Carbon Nanotubes: Toxic Effects are Determined by Density of Agglomerate Structures, not Fibrillar Structures” (2010) Journal of Toxicological Sciences 226–242; L Ma-Hock , S Treumann, V Strauss, S Brill, F Luizi and M Mertler, “Inhalation Toxicity of Multi-walled Carbon Nanotubes in Rats Exposed for 3 Months” (2009) 112 Journal of Toxicological Sciences 273–275; CW Lam, JT James, R McCluskey, S Arepalli and RL Hunter, “ A Review of Carbon Nanotubes Toxicity and Assessment of Potential Occupational and Environmental Health Risks” (2006) 36 Critical Reviews in Toxicology 189–217. K Donaldson, F Murphy, R Duffin and CR Poland, “Asbestos, Carbon Nanotubes and the Pleural Mesothelium: a Review of the Hypothesis Regarding the Role of Long Fibre Retention in the Parietal Pleura, Inflammation and Mesothelioma” (2010) 7(5) Particle and Fibre Toxicology, doi:10.1186/1743-8977-7-5; Y Sakamoto, D Nakae, N Fukumori, K Tayama, A Maekawa and K Imai, “Induction of Mesothelioma by a Single Intrascrotal Administration of Multi-wall Carbon Nanotube in Intact Male Fischer 344 rats” (2009) 34 Journal of Toxicological Sciences 65–76. K Takeda, K. Suzuki, A Ishihara, M Kubo-Irie, R Fujimoto, M Tabata , S Oshio, Y Nihei, T Ihara and M Sugamata, “Nanoparticles Transferred from Pregnant Mice to their Offspring can Damage Genital and Cranial Nerve Systems”, (2009) 55 Journal of Health Science 95-102. LK Adams, DY Lyon and PJJ Alvarez, “Comparative Eco-toxicity of Nanoscale TiO2, SiO2, and ZnO Water Suspensions” (2006) 40 Water Research 3527–3532; RD Handy, F von der Kammer, JR Lead, M Hassellöv, R Owen and M Crane, “The Ecotoxicology and Chemistry of Manufactured Nanoparticles” (2008) 17 Ecotoxicology 287–314; J Cheng, E Flahaut, HC Shuk, “Effect of Carbon Nanotubes on Developing Zebrafish (Danio Rerio embryos)” (2007) 26 Environmental Toxicology and Chemistry 708–716. HF Krug et al, “In vitro Assessment of Nanomaterial Toxicity: Need for Better Characterization of Materials and Methods” (2008) Paper presented at NanoEco-Nanoparticles in the Environment: Implications and Applications, Monte Verita, Switzerland, at 2-7. JJ Powell, N Faria, E Thomas-McKay and LC Pele, “ Origin and Fate of Dietary Nanoparticles and Microparticles in the Gastrointestinal Tract” (2010) 34(3) Journal of Autoimmunity J226-J233. TM Scown, R van Aerle and CR Tyler, “Review: Do Engineered Nnanoparticles Pose a Significant Threat to the Aquatic Environment?” (2010) 40 Critical Reviews in Toxicology 653-670. WH De Jong and PJA Borm, “Drug Delivery and Nanoparticles: Applications and Hazards” (2008) 3 International Journal of Nanomedicine 133-149. De Jong and Borm, see note 21 above. S Costigan, “The Toxicology of Nanoparticles used in Health Care Products” (2006) Committee on Human medicines, Medicines and Health Care Products Regulatory Agency, Department of Health, United Kingdom. A Fairbrother and JR Fairbrother, “Are Environmental Regulations Keeping up with Innovation? A Case Study of the Nanotechnology Industry” (2009) 72 Ecotoxicology and Environmental Safety 1327–1330. SD Sarma and M Anand, “Status of Nanotechnology in India”, Special Proceedings of The National Academy of Sciences India (2011) (In Press). DST and FICCI, “Nanotechnology: The Science of the Future”, Background Paper (2008) available at http://www.indiarnd.com/papers/R&D2008Nanotechnology.pdf (accessed 18 Mar 2012). Ebbessen and Jensen, see note 2 above. N Srivastava and N Chowdhury, “Regulation of Health Related Nano Applications in India: Exploring the limitations of the Current Regulatory Design” (2009) 25 Notizie di Politeia 58-74; Drugs and Cosmetics Act 1940 (DCA 1940), s 16. N Srivastava and N Chowdhury Nanotechnology and State Regulation (India)”, “in D Maclurcan and N Radywyl (eds), Nanotechnology and Global Sustainability (CRC Press, 2011), at 250. National Pharmacovigilance Protocol (NPP), para 6.1. Medical Devices Regulation Bill 2006, s 12 (o). Ibid, s 12 z (bb). Ibid, s 13 read with s 35.
 http://cdsco.nic.in/MEDICAL%20DEVICE%20page.htm (accessed 18 Mar 2012). “Sub-politics” denotes political decision-making beyond the realms of the formal state and without a clear and unambiguous legal mandate under international law. See, U. Beck, A. Giddens and S. Lash, Reflexive Modernization: Politics, Tradition and Aesthetics in the Modern Social Order (Stanford: SUP, 1994). Projects primarily dealing with research on nanomaterial use for drug delivery have been funded by the ICMR. Even amongst the curative applications, most offer solutions for diseases like cancer, diabetes and cardiac afflictions rather than malaria and tuberculosis. M Anand, N Srivastava, and S Sarma, “Policy and Ethical Concerns in Nanotechnology Safety: Case of Indian Health Sector” (2011) 7 Journal of Biomedical Nanotechnology 34-35. List of State Drug Controllers available at http://cdsco.nic.in/html/STATE%20DRUGS1.htm (accessed 18 Mar 2012). As per the Government of India, “Report of the National Commission on Macroeconomics and Health, Ministry of Health and Family Welfare” (2005), only 17 of the state drug controlling agencies had access to drug testing facilities. See for similar conclusions, World Bank, “Environmental Health in India: Priorities in A Pradesh” (2001) Environmental and Social Development Unit, South Asia Region, New Delhi, 4-6. Hathi Committee Report (1975); Task Force on Health Regulation Report (1982); Pharmaceutical Research and Development Committee Report (1999).